With the arrival of festive season, the whole country is immersed with the sacred feelings of faith and devotion for Maa Durga. This Navratri starts from 13th October 2015 to 22nd October 2015, which is basically as per Hindu Calender a period starting from Pratipada (First day) of brighter fortnight in Ashwin Maas (Month). The Navratri Season comes four times as per Hindu Scriptures, out of which current Navratri also called Sharadiya Navratri (as it commences in the beginning of the Sharad Ritu (Winter Season) ), is of great importance. The way it is celebrated across all part of India in remarkable. You know this is the specialty of the land of festivals and saints, where every festival is celebrated with the zeal and enthusiasm which is apparent not only inside the hearts but also on the streets. It is celebrated as a victory of good over bad, divine over evil. The legend says that there was a demon named Mahishasura , who after intense Tapas got the boon from Shiva, that no one in the cosmos can kill him except woman. On getting this boon of apparently immortality, Mahishasura was very adamant and started killing devatas, gandharavas and kinnars. After conquering earth, he even attacked swarga (heaven or Indra lok or abode of Indra). All the the gods were driven out of the heaven after the invasion of heaven. Gods then approached Brahma ji for help to come out this humiliation. Brahma took them to Lord Vishnu and Shiva, where looking at the boon given to Mahishasura, a feminine Divine Power was created with the individual spiritual powers of all the Gods including Lord Vishnu, Shiva and Brahma. 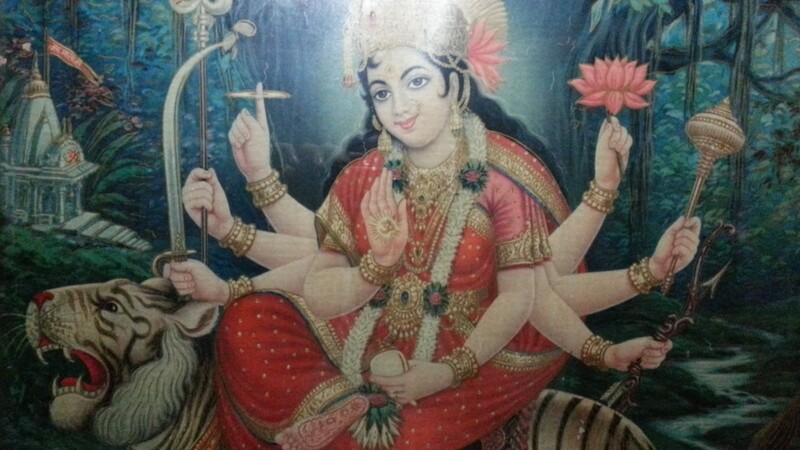 It was a female deity with 10 arms, equipped with the superpowers given by different Gods. Indra gave her Vajra, Sudarshan Chakra was given by Lord Vishnu, Trishul by Lord Shiva, Conch by Varun, Spear by Agni and snake by Vasuki. In this way Goddess Durga appeared with all the God gifted powers, to help the Gods in their difficult times. Mahishasura was mesmerized with the beauty of such a feminine power and out of utter attachment, keeping aside all the wisdom, he proposed the Goddess. As a result of which a fearsome battle took place between the two for nine continuous days, and Mother Durga killed the demon on tenth day. These nine days are celebrated as “Navaratri” whereas as tenth day being the symbol of victory is called Vijaya Dashmi. While Navratri signifies ‘Tapas’ & ‘Sadhana’ to achieve even the unachievable- Vijaya Dashmi is the symbol of triumph of good over evil. Even Lord Krishna worshipped Mother Durga just before the war of Mahabharata to ensure victory of Pandavas.